While I was at a Starbucks the other week, waiting for a rehearsal to begin, I noticed a mother who had brought in her very young baby; it was young enough that, if I had asked its age, I would've been answered in months, not years. I was reminded of what the authors of The Scientist in the Crib had said-- that the most fascinating thing about a baby is its intense fascination with everything that it encounters, and this baby was definitely riveted to every little thing that was happening around it. I watched the baby for a while and wondered about what it might be perceiving with its wide, intense gaze... and then, just for fun (I am an actor, after all), I decided to mimic the baby's expression and attitude. I'd learned a long time ago that you can actually feel a lot about a person's inner life by imitating them physically-- you can try this at the mall some time. Just fall in step behind someone, walk the way they're walking, and mime their gestures, and pretty soon you'll have a good idea of how they feel, and what kind of conversation they're having on their cell phone. By imitating this baby, I was quite surprised and pleased at what happened. Very quickly, everything that I saw seemed more interesting, because instead of being composite objects like "signs" and "tables" and "cups" and "people", they each had features and characteristics and colors that were unique and interesting just as themselves, even without acknowledging the thing they were a part of. Then I noticed that I was losing my understanding of what I was hearing-- the mother's voice, as she chatted with her friend, wasn't a conversation and wasn't even words, but was instead a kind of continuous musical sound. And every new sound that occurred seemed to hit me physically-- I felt a visceral shock every time the friend interrupted the mother, or the door's bell jingled, or a car motor roared past outside. I can only imagine that that baby must be fascinated by the world around it because every new sensation, no matter how small, crashes into its attention with a force many times what I was experiencing, and demands to be recognized. I agree with what's been suggested by other trainers-- if you clear your mind and "listen like a child", to hear without preconception or interpretation, you have a good chance of recognizing the true sensation of pitch. When you're practicing pitch memory, you auralize the pitch sensation, and then whatever you sing will automatically produce the right musical note. This is significant now because, even in my own practicing, I never allowed myself to just imagine-and-sing; I'd always first picture it as a piano tone before I could be sure. But just today, I imagined the feeling of an F, without trying to hear the piano note in my head, and I whistled the pitch that went with that feeling. And I had it right. Will a G# sound the same as an Ab? Will the same note sound differently with a different name? I wonder-- the reason a note would be "spelled" differently is because it's being played in the context of a different key signature. It's a confirmed fact that listeners with strong absolute pitch will hear an Ab as an Ab whenever it's played, in any context-- but what about relative listeners who learn absolute pitch, or even absolute listeners who learn relative pitch? Since different key signatures do have different "home" sensations, I wonder if someone who has absolute pitch but is also sensitive to relative effects will hear a G# in the same way as an Ab. After all, it's certainly true that when you put different colors next to each other, our perception of each color changes. Today I had the chance to read a nice big chunk of The Psychology of Music, which has reminded me to mention to you that there's a good portion of what I've said which is based on my still-limited knowledge of how the ear and mind work. There's still a lot more research to see. For just one example, one of the Psychology of Music articles suggests that the tonotopic mapping of the brain may not be for frequency, as I had thought, but could instead be for pitch. That would make it a psychological map rather than a physical one. Please remember regarding the things that I've said, on this website-- anything that I haven't clearly demonstrated, or explicitly validated using others' scientific evidence, represents my theories based on my research to date. My theories guide my inquiry, and everything I read will be scrutinized for its support or disputation of my theories, and I'll continue to be as straightforward as possible so you're always aware of what I'm speculating about versus what can be scientifically supported. Tonight I had an exciting experience. I turned on my laptop, lay down on the bed next to it (I have it on my nightstand), and opened an ear-training drill. It started with a pitch memory exercise, displaying a letter name and asking me to sing the pitch. I reached forward to press CTRL-P, to return to the previous lesson which would play the pitches for me to name-- I always precede a recall exercise with a session of note-naming, just to reinforce the pitch sounds in my mind. I hadn't done anything musical all day, so I expected I'd be lost if I just tried to recall notes right off the bat. But my finger pressed W instead. The program asked me to sing an F. Oh well. I have been able to pluck a C out of the air, before, rather consistently, but never an F-- yet, instead of trying to imagine the piano tone (as I usually do the C) I just let my mind wander into the feeling of the pitch. It settled, and I sang the note which corresponded to the feeling. I had no idea whether or not it was right; I just sang it. And then I checked myself-- plunk-- and it was right. I gasped and grinned and pressed W again. It wanted a C, now. I did the same thing, just letting the feeling come to me and singing whatever note matched the feeling. Tested-- plunk-- smack on target! I held my breath, not wanting to break the spell, but I pressed W a third time; twice could've been a fluke, but three in a row? D, this time. Relax, feel, sing, plunk... YES!! I laughed madly and literally threw myself spinning into the air, I was so pleased. Not wanting to tempt fate, I finally returned to the note-listening exercises, but it's nonetheless clear that the learning is happening. I'm back from San Francisco, and it appears that the auditions have gone well. I had traveled there with a friend who was also auditioning, so while I waited for her session to conclude I read a great big wad of The Language Instinct. Although I'm discovering that its material is, for the most part, more appropriately paralleled to music theory than absolute pitch, this paragraph jumped out at me and smacked me with a big hammer. The emphasis at the end is the author's. Kikuyu and Spanish infants discriminate English ba's and pa's, which are not used in Kikuyu or Spanish and which their parents cannot tell apart. English-learning infants under the age of six months distinguish phonemes used in Czech, Hindi, and Inslekampx (a Native American language), but English-speaking adults cannot, even with five hundred trials of training or a year of university homework. Adult ears can tell the sounds apart, though, when the consonants are stripped from the syllables and presented alone as chirpy sounds; they just cannot tell them apart as phonemes. Again, I'm baffled at how there can still be any doubt in the scientific community that absolute pitch is unlearned, since it's proven that the sounds of language are. But I'm mostly intrigued by the fact that the sounds are clear when isolated and unclear when presented in context, and I wish there were more explanation. What does it mean that the adults "cannot" tell them apart? What other clues are distracting them when they listen to two sounds in comparison, and how are those clues present in musical chords and phrases? I think there may be something very important about this linguistic effect, and for the moment I'm simply noting that it's definitely not enough to train your ear to hear notes in isolation. With the time I had on my hands, I also talked with some of the other people auditioning. I was pleased when every one of them reported hearing the vowel sounds correctly. I'd ask them to listen to an F and hear the "ah" sound (they did); then I played a D and asked if they could tell it was not an "ah" sound (they could). Then I'd play the D and ask if they could hear the "uh" sound (they could), followed by an F to see if they heard it as not an "uh" sound (they did). They were generally surprised to hear vowel sounds coming from the pitches, but the experience was so clear to them that when I explained to them that perfect pitch-- instantly recognizing different pitches-- was like this, they weren't at all surprised, but nodded knowingly. February 22 - Who's Johnny? It's worth noting that as the sensation of each practiced note becomes clearer to your memory, the distinction of each new note becomes easier to hear. You won't be "adding" notes so much as you'll be familiarizing yourself with their unique sensation. I had a small debate with someone-- I forget exactly where we carried it out, but I think it was in a Web discussion group-- who thought he was failing because, once he added a new note to his exercises, he recognized it because it was "the new note" and not because of any inherent quality in the note. I suggested that he heard the note as "new" because he recognized its inherent quality. If he wanted to clarify that experience, I recommended, all he had to do was attach a trigger word, or meditate on the feeling of the new note every time it occurred instead of just naming it and moving on. Ultimately, I didn't convince him of anything, and as far as I'm aware he persisted in his "failure", although perhaps he eventually realized he was doing all right. I realized an additional significance of the passage I quoted from The Language Instinct in my previous entry-- nobody ever has any problem with identifying unusual vowel sounds (or, analogously, pitches) in isolation, but as soon as you put those into context you get hopelessly lost. The emphasis there is on hopeless. It's entirely possible that someone could learn to name any note when it's played all by itself, but become quite useless when there are competing notes or relative effects to be contended with-- and never get any better, just like the immigrant who speaks with an accent for their entire adult life. That is, there is a massive gulf between these two abilities, between being able to discriminate isolated differences and being able to adjust to a multilayered context; the first one is nigh-instantaneous and the second near-impossible. I can tell you from my own experience how I recognized immediate results. The point of the Pitch Acuity drills is simply to begin recognizing the sound of a pitch when it's played with other sounds. After about a week of singing the individual notes in two- and three-note chords, I didn't really notice any kind of progress, exactly, but then one day I got into my car and turned on the CD player-- and I immediately wondered if I'd somehow changed the settings on the thing. The music seemed brighter, clearer, more alive than it ever had before. I thought maybe someone had cranked up the treble. But I checked the treble, then the bass, then fade, balance, and whatever else it occurred to me to check, but everything was absolutely normal. I shortly realized that it wasn't the machine which had changed, but my ability to hear the sounds of the music. If you don't practice often, you will backslide and lose the learning you've gained. This is because of the plasticity of the brain; although I haven't yet secured a book on memory (it's on order, and should arrive in a week or two) just puttering around Norman Weinberger's website should be enough to make clear that you're rearranging your neural pathways, and this is only accomplished through constant and consistent reinforcement. This isn't like learning an academic subject, where you can go through a cycle of cramming and slacking and still do well recalling facts for the test. You've got to keep up a consistently steady flow of reinforcement in order to permanently influence your brain patterns. Brain plasticity explains at least one other thing. If you just "get it right" in an exercise-- naming a note correctly with relative pitch but immediately moving on-- then you're using existing neural pathways, and we want our minds to recognize that the new pathways are important. The other day I was reading The Psychology of Music and saw (not coincidentally, in the chapter written by Weinberger) that experiments had been conducted which showed that animals' neurons were made to fire differently in reaction to certain sounds, simply by virtue of being psychologically convinced that those sounds were important (with food, or by electric shock, or something like that). If you take the time to convince your brain that the pitch sensation is important, then your brain will change its pathways to respond to the new sensation. When you're playing notes for any of the exercises, you can repeat them, play them for longer durations, play them separately, do whatever you have to in order to hear what you need to hear. Last night, the circumstances were the same as on February 11: I began with a pitch-memory exercise, and it again asked me for an F. I hadn't done anything musical all day, and I was exhausted from the day's events, but I figured what the heck. I didn't picture a note-- just summoned an abstract feeling, and sang whatever I felt like. I didn't even bother to make it sound like a piano note in my head. I must tell you that it was downright unnerving to then play the note and discover that I was exactly right. I remembered that the last time this happened, I stopped after identifying only three notes; in hindsight, I'd wimped out. This time I decided I'd soldier through and see what happened. And I was amazed. Only once before have I started a listening drill completely raw and named 20 in a row without error; usually I have to make a few mistakes before I can do 20. In this recall exercise, though, I kept getting them, note after note, just by releasing from my throat the pitch that felt like a C, D, E, F, or G. All 20, all in a row, with no mistakes. I shut the computer off and considered the event. I still lack confidence, and I don't mean self-esteem. I mean that I don't think "E" and pop! confidently have the right feeling in place. Instead, I begin by auralizing an unnamed pitch that seems close to what I want, and then I slide that feeling around until it feels "right". If there had been any other sounds in my environment-- a television, a radio, someone talking on the phone-- the feeling I needed to find would have been obscured by the influence of the competing sound sensation. I also didn't fully comprehend how the feeling and the pitch go together, even though I had successfully made the association. Every time I checked myself on the computer, it sounded strangely distant, as though what I was feeling (and singing) was somehow disconnected from the pitch that the computer was producing. But regardless of how "weak" the sensation had been, or how "disconnected", the fact remains that I accurately produced twenty random pitches without relying on anything except my own powers of recollection. These exercises... are working. Even though we may say of an athlete or actor that they were "born to do it", how many of us really think that their talents don't even exist, in some residual form, in all of us? I'd think that if most of us felt that we couldn't play sports or couldn't act and sing, there'd be no such thing as community theater or the YMCA. My mother visited California the other month, and while she was here, sitting on my keyboard bench (which was the only seat in the room), I encouraged her to play notes for me to name. She played a few notes-- I forget whether or not I got them right-- and then, after a short time, she began to carefully pick out a few major and minor chords after each of my attempts. I'm not sophisticated enough yet to identify any three notes played together, and since I hadn't asked her to play chords I thought perhaps she was just exploring the sound of the keyboard, comparing it to the sound of her own piano at home. I had wanted to do the exercise, but I didn't want to interfere with what she was doing, so after about six or seven of these interruptions I asked if she'd rather play the piano instead. She said no, and explained that she had actually been playing the chords to make the exercise more challenging for me. I was astonished. My mother has a professional history of language education, and speaks a half-dozen languages herself. I asked her, rhetorically: if she were quizzing someone in language vocabulary, would she pause between flash cards to shout disorienting nonsense syllables at them? She sheepishly agreed, no, of course not, and we continued the exercise without the extra chords. It's fascinating, isn't it, that even someone with very little experience with or interest in perfect pitch-- yet who has extensive experience in education and language acquisition-- will automatically assume that playing random confuse-notes in between trials is somehow beneficial. It's true that confusing notes may be useful if you are trying to determine how well the note-sensations are already established in the subject's mind, and I think that's why most people feel obliged to put them in. That is, when an ordinary person thinks of "testing perfect pitch" they probably think of the scientific trials they may have heard of, conducted on people who already have absolute pitch, for which it is important to clear the subject's mind before they move to the next data point. Although I'm not versed enough in music theory to discuss how the relationships between notes create character, I had an interesting experience with color feeling late last year. As we prepared to open the musical I was performing in, it was determined that the soulful solo of the leading lady was just too low for her vocal range. Since the instrumentation had already been recorded, we used Cool Edit Pro to transpose the sound file mathematically into another key. By this time, though, I'd already heard her sing the song a dozen times; I was on stage pretending to sleep while she sang it, and I enjoyed listening to her so much that I'd always pay close attention to her while I was lying there, and listen to the powerful emotion in her voice as she knocked the audience right out of their seats. Once the song was transposed, I was surprised to discover that the song had changed. The emotion just wasn't quite as moody, not quite as full of longing, not quite as bittersweet as it had been. The song still sounded the same, and she sang it with equal abandon, but the way it felt was clearly different. I took up piano when I was four, in China. I wasn't taught using the Suzuki method, but there is something that was very different from the Western mode of teaching-- middle C was identified as "Do", D "Re", E "Me", and so on, not simply the tonic, supertonic, etc, of any key... Not vowels, but extremely similar. Since I could remember, when I hear a note it is very clearly its assigned identity in the "Do Re Me" system. A B would be a Te. An F "fa". This was so matter-of-fact that I simply assumed that each note had that syllable ingrained into its tone, and that everybody could hear it. I don't hear in colours, or images, or captioned comic strips. Just very distinct, very clear syllables that my brain has associated with pitches. Her experience appeared to be identical to my experience of associating notes with numbers instead of letters, except that she was triggered to think of the sol-fa syllables instead of numbers. But then, in re-reading her note, I considered the possibility-- what if she really did, as she said, literally hear the syllables in the notes? What if it wasn't just a trigger association like my numeric assignments? But that would mean... I quickly drew a small table. The parallel here is strikingly close. "Fa", of course, is right on. It doesn't immediately appear as though the others would be, but don't forget that the vowels in these syllables are diphthongs. "re" actually has two syllable sounds-- "ruh-ay"-- even though the "uh" disappears quickly. So too is "ti" pronounced "teh-ee". Similarly, the "i as in time" vowel is actually the first half of the entire vowel sound "ah-ee" (la). Additionally, there is an impostor in the list. I was fascinated to learn that "do" was originally "ut", which is nearer to the sound of "o as in board" (although "do" is still close enough). It's all near enough to make me think that perhaps this woman does in fact hear these specific syllables in each pitch. It's tempting, but it might be going too far, to suggest that back in 1000AD these sol-fa syllables were created for each note because of their absolute-pitch vowel sounds. The ancient Greeks did use vowel letters to label their notes. The mismatched "sol" could be dismissed by hundreds of years of change in music and language, or understood via some aspect of the original Latin. And the words of that eighth-century hymn, created before formal musical notation, could have actually represented which pitches to sing (chant? ), instead of being arbitrary assignments to an abstract melody-- but despite any compelling suppositions or circumstantial associations, there just isn't enough hard evidence to make this hypothetical origin more than a "pretty idea". It's fun to think about, though, isn't it? But we do have more than a pretty idea on our hands here. In the first place, the vague statistic that more music students in the East have absolute pitch is now concretely explained; here is documented, first-hand evidence of a style of musicianship which spurs the development of absolute pitch in its young students. Secondly, this offers a persuasive perspective on Miyazaki's results, when he showed that people with absolute pitch tend to hear in fixed-do; because, to them, the notes do not move, hearing a "do" would instantly create the impression that they are hearing the first note of the literal scale, regardless of its musical context. Not only can you not force your ear to do anything, but you can't really force yourself to remember anything. All you can do-- all you should do-- is keep exposing yourself to the sensation (and I mean "exposing" almost literally) and let it take hold of you. I know dozens of people who can recite Monty Python and the Holy Grail from beginning to end. How many of them, do you suppose, sat down with a script and forced themselves to study and memorize the lines? I could, right now, recite every single line of the movie Yellow Submarine, even though I haven't seen it for years-- simply because a decade ago I saw it 49 times in two weeks. I never tried to memorize the lines; I never even expected that I would remember them. I just happened to notice one day that my mind knew them all. If you open your mind and keep pushing these notes onto it, easily and gently (and with the correct technique), without actually trying to remember anything, eventually they will take root. When I first started my research, I liked metaphors and analogies, and I used a lot of them. They seemed to be the best, clearest way to explain what I was thinking. But I was excoriated for my confidence in them, and eventually I had to give them up completely. The benefit of a metaphor is, of course, that it can help to solidly frame an unknown, mercurial concept. An analogy can give you familiar expectations for an unfamiliar idea. But the detriment of metaphor is that, because the comparison is easy to understand, people often settle for the analogy as though it is the explanation (as I originally did). But analogies are not explanations; they're only hints. Even to the poets who use them, analogy and metaphor are only clues to help you understand and explore the true situation. You may agree that a cloud is "like a big cotton ball", but you're not going to learn anything about clouds by studying cotton balls. If an analogy is not being drawn between things which are known to be completely identical, the analogy is just as often misleading as it is helpful. An analogy is the introduction to a problem, not the solution. One fellow wrote to me and said that "it's only when I smoke marijuana that the pitches are totally clear to me." When you learn perfect pitch, your listening exercises are designed to connect you with the unique sensory feeling of a pitch. When you take a drug, which affects your body chemistry, you feel differently. It doesn't matter how clearly you may hear pitch sensations when you are on drugs, because once you're off drugs, the pitch sensation (minus the narcotic effect) is a totally different feeling! Even if you heard pitches clearly while you were on drugs, you heard them wrongly. You didn't learn a thing. There. I didn't research that anywhere; I just made it up. It seems logical, though, doesn't it? It seems unlikely to me that even the most indulgent musician would want to have to get high every time he wants to recognize pitches (although I probably underestimate some people's enjoyment of drugs). (UPDATE 7/1/2003: An alert reader has written with this contribution: "I thought you might be interested to know that you're actually very close to the scientific truth here, as far as I can remember from my college health class anyway. When covering the effects of drug use, my teacher mentioned some research concerning learning while under the influence of some chemical-- any chemical. When you learn something while in any kind of 'altered state'--drunk, high, over-stimulated from too much caffeine even-- your brain will recall this newly learned material in the future best if you return to the same chemical state you were in when you originally learned it. If I remember correctly, researchers have shown this in clinical studies. You know, there's a question that I haven't explored: why do our minds get "tuned" to a certain key signature, which gives a different context to all the notes? Might it bear some similarity to how our eyes adjust to blue if we stare through red plastic for a while-- or are our minds trying to normalize the sounds into certain consistent patterns? I've been accepting the idea that these sevenths notes will allow us to avoid hearing a "top note" and "bottom note", but why is that avoidance necessary? Exactly how, psychologically, do these sevenths notes help accomplish it? Why do our minds try to adjust to a key signature-- and is it the same for colors? These are somewhat involved questions, and someone's probably researched them somewhere along the line. For now I'll just recognize the problem exists and move on. Apparently, my entry about drugs gave some readers the impression that I am telling you not to do drugs. No, indeed-- I don't know anything about recreational drugs, and have no drug experiences of my own to relate. I don't even have evidence to recommend using them or not using them. I read a highly relevant passage in Memory and Brain. The author was writing about how bodily processes originating outside of the brain can influence memory within the brain, and introduced the problem of drugs and memory. Behavioral studies of the effects of drugs or hormones have demonstrated that many different agents given shortly after a training experience can disrupt or facilitate memory... What one then wants to know is which neurotransmitter systems are involved in mediating the effects on memory, how these systems exert their effects, and whether pharmacalogical treatments affecting memory might mimic the action of endogenous neural systems whose usual function is to influence the strength of memory. I would never encourage anyone to start using drugs, but it's a tricky issue. You could say that by telling people that you've had interesting and positive experiences smoking hemp, you encourage them...but when you arrange a barbecue or just a regular party with friends, one could argue you promote alcohol use... Anyway, that part of the drug issue is way too complicated to take a stand in. What I disagree with is the... "burnt neurons" argument, as well as the "abnormal state-of-mind" theory. My subjective experience is that 1. I was extremely encouraged by the feeling of sensing the pitch that clearly. 2. I could take (some part of) that feeling with me into the normal state of mind, kind of what the meditation exercises during calm, focused practicing does to your everyday pitch naming and (to me most important) to playing music. I've done this with other feelings as well. One particularly (to me) important example, is a few years back when I for a long period was dissatisfied with a lot of things in my life. I didn't exactly feel depressed or a lot of anxiety, but I knew something was wrong. Thoughts were going in circles, nothing felt real or important. The first step I tried was to try anything that would "mentally arouse" me, I was seeking excitement wherever I could, that led me to start studying psychology at the university, about at the same time I started experimenting with marijuana. During that intoxication, I could really feel what I was really feeling, like the whole world opened, got real, sharp, and things like music and art got its meaning back. That gave me hope and something to strive for to get (back?) into my life. Now me, I'm sending the jury out on this issue-- permanently. Your choice to do drugs, or not, is your own, and what may or may not result from your experience is your own business. I have no interest in pharmaceutical research, nor do I intend to encourage anyone to combine drug use with the curriculum I develop, so I'm not even going to take a stand one way or the other. The fact that there is a distinction between the structure of a chord and its feeling-- a feeling which is different from the sensation of the chord's root pitch-- insists that the nature of absolute-pitch sensation extends beyond mere cognizance of spectral pitch input. Absolute listening incorporates complex sounds. I don't know how important this distinction will be, yet, nor even exactly what it means, but I'm definitely going to keep it in mind as I continue my research. I suspect that it will give me intriguing new perspectives on existing ideas that I encounter. I'm already thinking about re-visiting prominent sources, after re-reading Levitin's primer today. My research supports more of his statements than I originally expected it would-- but not for the reasons he gives. For instance, I initially speculated that Levitin was mistaken to describe absolute pitch as "linguistic coding", since it seemed that absolute pitch was a form of sensory perception. Although now I would agree that absolute pitch is indeed a type of linguistic coding, I would not say that the "coding" is that of assigning verbal letter names to categories of musical pitch, as Levitin describes; rather, I suspect that "coding" is the mental processing of pitch sounds as though they were language. I may want to revisit Levitin's paper every so often just as a touchstone to see how my research has progressed. Absolute feeling of chords and linguistic coding of pitch... back to back... you've floored me today. I don't know if joining these ideas was intentional on your part, but it got me to thinking. A chord has a relative feeling to it, and each individual note in the chord has an absolute feeling to it. So would the absolute feeling of a chord be the sum of those two parts? Using analogy to language (which only points to a thing and is not the thing), a chord would be a sentence, and the notes words. The sentence has an intention, or a feeling, but the individual words chosen to form that sentence can dramatically effect the overall perception, or feeling, of the sentence. The words can intensify the underlying intent of the sentence, or even contradict underlying intent as is the case in irony. So by extension, perhaps notes can do the same for chords. "Dark" notes can intensify the mood of a minor chord or add musical irony to a major chord. I confess that joining the two ideas wasn't intentional, in that entry. Rich's comment made me think, though, of the implications of what I've been exploring. I think Rich definitely has the right idea, and I'd encourage you to think about what it means to your own musical experience, but I'd be more inclined to say that a chord is analogous to a word, not a sentence. I said some while ago that when we hear a nonsense word like "gref", we instantly recognize the phonemes gr, eh, and f, and I compared that level of perception with the absolute-pitch perception of the notes in a chord. The connection I failed to make at that time, which Rich has just kindly done for us, is that even though the word "gref" is composed of its individual phonemes, the composite sound "gref" has its own complete sound which is neither gr, nor eh, nor f. In fact, these very ordinary and non-humorous phonemes combine to make a word which is, undeniably, silly. The composite sound takes on a character which is clearly composed of the phonemes, but conveys a sensory feeling that is none of its components. The word is not more than the sum of its parts-- it's something completely different from those parts. Furthermore, you can add an intellectual layer and turn it into a symbolic word; perhaps "gref" is the sneeze of a small rodent. Surely this is directly parallel to a chord, composed of pitches, with its own unique sound-- and when we hear that sound, we can ascribe the symbolic meaning of "minor C chord." The parallels between language and music theory seem stupendously obvious, and the more I've thought about it the more it's seemed to me that the structures and perception of language and music are alike. In fact, I came up with an amusing little exercise which could, ideally, put an end to the debate about whether a song transposed is in fact the same song. You can do it yourself; just say the word "well". Now say it at a different pitch. In each case, imagine the context in which you'd have said the word at that pitch. I'm sure you'll find that each pitch had a different reason-- perhaps one was "satisfied" and the other was "pleasant surprise". "Well" conveys a different emotion, spoken at different pitches, even though it's obviously the same word. I had a lot of fun with "well"-- I said it at different pitches; I said it with upward and downward slides; I said it with slides of identical distance but in different pitch ranges-- each time, it was still the same word, but each time the expressive meaning was recognizably different (if not completely so). I stopped at about two dozen different variations, but I could've continued. This makes me wonder if "tonal languages" are really so peculiar; even in standard English, the same word can mean something completely different if varied in pitch or emphasis. I've read anecdotes about people who can sit down and read musical scores "as though they were books." I've read science fiction stories (Alexander Key's Rivets and Sprockets immediately comes to mind) in which characters speak in musical languages. I even read somewhere, years ago, a comment that music is merely "sped-up language", although at the time of course I didn't take it literally. It seems inescapable to speculate that music is, in fact, language. I've only glanced at the science of prosody, but surely its leading researchers have known this for years... so where's the research? Where's the publication? How is it even possible that Jane Gitschier, who has access to far more scholarly research than I do, would still be convinced that absolute pitch is some kind of genetic aberration? As you can tell, today's entry answers absolutely nothing. This is just a moment to stop and consider. I am fascinated by the idea that spoken language is merely a subset of our linguistic perception, and absolutely entranced by the possibility of what could happen if children were taught to incorporate the entire superset of musical sound in their understanding of language. These two ideas alone could spin me off into decades-- decades-- of research and exploration. I know that I've only been doing my own research for barely a year and a half, and I credit the Internet with making it possible for giant leaps to be made (if I'd had to rely on local libraries, I'd never have learned vowel-theory from Peter in Europe, nor have seen the work of Miyazaki or Levitin, and so on)... and I'm awestruck to wonder that if this much can be discovered in merely one and a half years, how much more will we discover in the years to come? Last night's ear training session had me wondering again about why Jane Gitschier is pursuing genetic perfect pitch. Did she never try to learn it for herself? In my session, as I identified notes from C through A, the sounds just seemed so obvious! There's no question that my perception of musical pitches has evolved, and I am well beyond the age that she says a gene needs to be "activated". I also understand why someone with absolute pitch would be at a complete loss to explain themselves; once you start hearing the pitches for yourself, you wonder how it's possible that anyone else can't. Even without direct experience, the popular science is out there to show that the unlearning of perfect pitch could be explained by ordinary human learning and growth. Memory and Brain shows, with scientific illustrations, how unused neurons are either co-opted or abandoned, and thus made unavailable for alternate tasks. 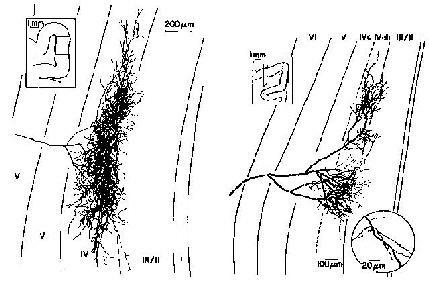 Here is one of those illustrations, showing the difference between a certain part of the visual cortex of a kitten (left) and an adult cat (right). The young cat's brain has far more cells than are necessary, but any of the cells are receptive to learning how to perceive vision. As the cat matures, the cells which are not used by the visual process will die or be reassigned. I was reading more of The Language Instinct today, and discovered that Pinker had made an important correlated point. Genetic research has said that absolute pitch is probably genetic and developmental in origin-- that is, you need the gene, but that the gene has to be "activated" or else you will never gain the ability. Yet, even if you accepted that perfect pitch must be learned in early life or permanently lost, both Squire and Pinker have provided legitimate reasons why that loss doesn't necessarily have anything to do with an "activated gene". It could be that, like language, the brain structures you would otherwise have used to learn absolute pitch (or any language skill) remain unused, and therefore disappear. You don't need genetics to explain this process; it's how the brain works in normal perceptual learning. Although Pinker doesn't talk about perfect pitch, he does speculate about the effect of genetics on perceptive ability. ...like perfect pitch. Language perception is a complex task-- a mindful task-- and, according to Pinker, engages more of the brain than could be explained by a single gene. This illustrates why I'd expect that genetic research is not going to be conclusive. It seems extremely unlikely that the effect of a single gene would produce absolute pitch, or account for the varying levels of perfect-pitch skill which can be demonstrated by those who acquired it spontaneously. Interestingly, though, in Pinker's description of how the task of sound comprehension is distributed across the brain, he mentions something that I certainly hadn't thought of before. Nering pointed out that we tend to categorize sounds that we hear as "musical" or "non-musical", but she was merely making a point about a range of sound frequencies. Pinker has expanded this notion to show us that, physically, different parts of the brain respond to sounds depending on what we think we're hearing. When we hear language sounds, we process those sounds in the left hemisphere of our brain-- but when we hear non-language sounds, we don't. Now I have a reason for why perfect-pitch ear training should be done both with trigger words and with vowel sounds. The trigger words-- the emotional, artful, musical interpretation of the sounds-- engage the right side of your brain. The vowel sounds-- the literal, expository, linguistic interpretation of the sounds-- force you to use the left side of your brain. Both will be necessary for full comprehension of perfect pitch. I've recently had the pleasure of meeting with Dr. Norman Weinberger, at the University of California Irvine. I had contacted him in the hope that he could help me understand how to guide my own research in the field of music cognition, and I was not at all disappointed. There was a lot of information condensed into that short afternoon, and I expect that I'll probably mention various aspects of our conversation in the weeks to come; I mention it now because he spoke quite clearly an idea which I'd intended to communicate. He asked me, rhetorically: if you have an idea that works, and you want to share it, do you really need to know why it works? He emphasized that very little about how the brain works is known for certain, and implied that if I wait around to "prove" anything before putting forth my own work I might be waiting a very long time. Robert, a reader with absolute pitch, sent me some responses to what I've written. My words are in italics. "And will a G# sound the same as an Ab? Will the same note sound differently with a different name?" Despite learning absolute pitch from an early age, I've picked up a good deal of relative pitch, and also a good deal of what I call "musical sense". If I pick up that a song is in C, and hear a note that to my ear could either be F# or G, I will pretty much cancel out the possibility that the chord is F# and rule it as G automatically, seeing as G is the V chord and F# isn't even in the key of C. That said, and hoping that this explains a bit more of the nature of my pitch sensitivity, I do automatically convert G# to Ab. However, if I hear a note incorrectly for whatever reason, I generally hear the note a semi-tone sharp. I would hear a B as a C; an F# as a G. (I also have almost perfect success when confined to the key of C, with my rate of success going down considerably when the entire chromatic scale is fair game for testing) On rare occasions, I have heard a note a semi-tone flat instead of sharp, and am intrigued by your question about key signatures. I've never been too strong with sheet music, and I rarely think of notes beyond the more common names-- Notes are always Bb, Ab, F#, Eb, and C#; never A#, G#, Gb, D#, or Db. I'd never considered whether my relative hearing was intruding into the realm of the absolute and was causing me to hear A instead of B when incorrectly naming a Bb. "I wonder... if there's any issue with people who may be able to play instruments well but can't sing. ...does having good pitch perception mean that you'll be able to make your voice behave and produce the note you want? I honestly don't know. ...Now that I know how to whistle, I've actually found it easier to whistle instead of sing, for my ear training exercises; singing creates all kinds of extra sensation (the formants of the "ah" sound that I sing with, the resonance of my head, etc) and whistling is confined to the front of my mouth." I've found you're correct about whistling and I'll clarify what singing and pitch hearing is like for me--confusing. When I sing, or even hum, I produce a vowel sound. This masks my perception of the PITCH vowel sound and makes it more difficult to tell what note is being played. Added to the fact that my singing voice is very undeveloped and wavers flat and sharp almost constantly (like you mentioned about "tone-deaf"ness just being the inability to sing, not to hear) and the identification process becomes a LOT more difficult for me. Whistling is difficult as well, although to a lesser degree. There is less of a masking vowel sound, however the off-key problem is still inherent--which causes me to wonder if playing a fretless bass or violin would cause the same problems. In a related matter, there's a solo that I have memorized on guitar that ends with the bending of a high D to an E--my fingers have never been able to memorize exactly how far to bend the string, but my ears DO tell me when to stop. I don't know if this is a tuning thing that everyone can hear or not. "[The sol-fa system] is all near enough to make me think that perhaps this woman does in fact hear these specific syllables in each pitch." When I first read your mention of vowel sounds in the first half of the review, I assumed that you'd been talking about the same ones that the woman mentioned. Like her, I learned "Do Re Mi" more strongly than "C D E" and when I hear a note, I hear "o, e, i, a, o, a, i" Because of that, in C major, I never miss Re, and if I confuse a note, I can get it on the second try without fail because I would have guessed G instead of C, E instead of B, A instead of F. So my ear DOES hone in on the original naming convention's vowels, not the "true" vowels that you've mentioned. I agree with the hypothesis presented in the next paragraph that the "Do Re Mi" convention may have stemmed from the vowel sounds. When I've heard music teacher pronounce it, they've said "So", leaving the "l" silent, which led me before reading your article that the naming convention may have come about as a private joke among those that can hear absolute pitch--or perhaps everyone in the early days of written music COULD hear the pitches. I met with Dr Norman Weinberger last week because I wanted his guidance on conducting research in the field of musical cognition. Dr Weinberger's professional research is currently focused on "brain plasticity in musical memory". He is a leading authority (if not the leading authority) on the relationship between brain physiology and auditory perception; he is the scientist who wrote the definitive article, "Music and the Auditory System", for Diana Deutsch's The Psychology of Music. I was eager to find out from him if he knew of any critical research that I'd overlooked. By e-mail, he'd already pointed me to Bruce Goldstone's excellent resource on perceptual learning; I figured that if I'd managed to overlook something as essential and relevant as that site, there must be other blockbuster concepts he could tell me about that I hadn't yet thought to find. I was also looking forward to asking Dr Weinberger about hypnosis. I'd only just begun my examination of brain and learning, and I wanted my upcoming review of Graham English's course backed with some hard science. I wanted to hear Dr Weinberger's expert assessment of how hypnosis helps you learn. Who could possibly have a more informed opinion, I reasoned, than a man whose academic career has been dedicated exclusively to "programming the mind"-- with music, no less! I was certain that Dr Weinberger would be able to quickly explain the basic principles of hypnosis to me, and its physical effect on neural activity. I was looking forward to hearing Dr Weinberger's description of how, physiologically, hypnosis alters the brain in the process of learning. I hoped to learn from him precisely how the trance state enhances a person's receptivity through neurological structure, allowing that person to learn more readily. In conversation, Dr Weinberger is calm, thoughtful, and studiously neutral. For most of our conversation, his voice was quiet, his eyes were intent, and he rested comfortably in his chair. When I introduced myself, and explained how I was developing a curriculum to teach perfect pitch, he seemed so impassive I wondered if perhaps he was humoring me as a crackpot. So I asked him if he was skeptical, but he said with a casual shrug that he was neither skeptical nor non-skeptical. Since that subject was outside of his expertise, he said, he would neither dismiss nor accept the idea without understanding the relevant evidence, and named a few scientists (including Diana Deutsch) whom he knew to be developing that evidence. I was encouraged, and we began to talk about the questions I'd come to ask him. We didn't have much time that afternoon, and I wanted to learn as much as possible about hypnosis, so after explaining some of my research I began by steering the conversation in towards hypnosis. However, the instant I spoke the word "hypnosis", Dr Weinberger's entire demeanor changed. He took a sharp, deep breath, broke eye contact, shifted his weight visibly and uncomfortably, and an exasperated frown threatened to occupy his face. His reaction was so strong I was quite alarmed; I felt like I'd just asked Carl Sagan to forecast my horoscope, or cold-called James Randi to sell him a subscription to Sylvia Browne's psychic hotline. I feared for a moment that he was going to throw me out of his office! I hurriedly explained that I was not promoting hypnosis, but I wanted to know because of the review I intended to write. Hearing this, he let out his breath, leaned back, and held out both hands with palms up; with a cautious and slightly condescending grin, he said he'd want to know what evidence existed to demonstrate that a hypnosis program worked. Just show him the evidence. I told him I didn't know of any evidence, but I wondered if he could tell me something about hypnosis so that I would be able to speculate. Dr Weinberger politely, and firmly, refused. We human beings only live so long, he said; we can't learn everything there is to know about everything. And hypnosis, he said, I do not have time for. Still surprised by Dr Weinberger's reaction, I couldn't think of a new topic, so I pressed on, wondering if he could at least describe what he knew of how the brain changes in a hypnotic state, in a general sense... but he cut my question short. He leaned forward, and with a twinkle in his eye-- and the resigned smile of a man weary of speaking truth to those who will not hear-- he shook his head and said "There's no such thing as a 'trance state'." You probably know exactly what you, personally, would recognize as a "trance state". I can picture it immediately: glassy eyes, relaxed body, monotone voice, mind open to suggestion. Dr Weinberger didn't attempt to deny that a condition which demonstrates this combination of attributes can be achieved. In his explanation of "there's no such thing as a 'trance state'", what I understood him to mean (I repeat, I did not write this down) is that there is no significant physiological nor neurological change induced by "hypnosis". The observable "trance state" represents a deliberate choice and effort made by the person who is "hypnotized". There has not been some mystical alteration of their brain or biology. In that context, I could say that I enter a "hypnotic state" when I do my theatrical focusing exercises. Using a systematic program of muscle control and mental concentration, I flush out my normal personality and fill my mind with "suggestions" which will cause me to behave and react in ways that I ordinarily would never do. Hypnosis, it seems, is merely a structured integration of ordinary relaxation exercises and suggestive techniques; therefore you could say any specific combination of relaxation and suggestion is "hypnosis". Since hypnosis does not induce any physical change in its subject, the effectiveness of a "hypnotic program" would therefore be completely dependent on the subject's ability to relax and cooperate. Dr Weinberger wryly praised that fact as the best defense of hypnotic therapy-- if you find that hypnosis doesn't work for you, then there's nothing wrong with hypnosis, there's something wrong with you. The irony is apparent: that argument in favor of hypnosis, even though it is directly true, implicitly confirms that hypnosis is not a sophisticated science which consistently compels deep mystical effects. Rather, it's a way to trick yourself into doing things that your body and mind are already capable of. Now, I'm writing all this based on the opinion of only one man-- a man who readily admitted that he had not studied hypnosis. What if I wanted to learn from the source? What if I wanted to become a Certified Hypno-Therapist (CHT)? I know people who have trained as therapists; my father was a professional psychological counselor for almost all of my younger life, and one of my readers has described her education as a psychiatrist. I know the intensity of the studies they committed themselves to, the depths of inquiry that they achieved, and of course the heavy debt loads that they incurred in their tuition and living expenses as full-time students. It takes years of hard work and dedication to gain an understanding of the centuries of science, medicine, principles, and practice that will enable to you become a therapist. Just glancing through the dozens of dense textbooks on my father's shelves demonstrated that to me a long time ago. But that's what it takes to become a professional clinical therapist. So, then-- what does it take to become a professional hypno-therapist? What do you need to do in order to claim mastery of that discipline, and claim your title of "CHT"? Apparently, you need to pay $900, and give up 100 hours of your spare time. I'm definitely in agreement with Dr Weinberger in one respect-- life is too short. If I had $900 to burn and that much free time, I'd prefer to become a professional massage therapist instead. But seriously, hypnotherapist training makes sense to me partly because I did take some massage classes at IPPT, and I thoroughly enjoyed them. IPPT has a "practical" approach to massage-- it's almost their entire sales pitch, and it's exactly why I took classes there. They don't bother to train you and test you on human anatomy. They don't try to explain the science. They don't try to illuminate you with the history and theory of massage technique. They don't even tell you the names of the muscles. What they tell you is this: "Here's an arm. See what I'm doing? This is how you massage the arm. Now, go for it!" What you learn from them is how to implement their techniques-- and, honestly, that's all you really need to know. If "hypnosis" has no effect on the body or mind-- if "hypnosis" is just a word that describes a strategic combination of relaxation and suggestion techniques-- then if you're studying to be a "hypnotherapist", all you need to learn is which techniques, and how to combine them. You don't need to know how it works; you don't need to know any science; you don't need to know, really, anything about human psychology or neurology. All you need to understand is how to talk your client through exercises A and B. That's something you could easily learn in a hundred hours. And if the exercises work, and can help you do something difficult-- why ask why? I can think of one reason why I wouldn't settle for that, just for my own research-- because by trying to understand "hypnosis" I wouldn't learn anything about what's actually happening in the body or the brain. All I'd learn is the technique of putting exercises together. For myself, I need more than that. A reader has provided me with the source that I needed: a scientific perspective of hypnosis. She alerted me to the work of Irving Kirsch, whose research is apparently focused on "response expectancy". Kirsch covers hypnosis exhaustively, and I found some of his work in a posted archive of articles about neuropsychology and hypnosis. The effects of mesmerism and hypnosis have seemed so unusual... it seemed impossible for suggestion to have such extraordinary effects, without there being some kind of special state creating them. The results of research on hypnosis in the twentieth century have clearly invalidated that conclusion. One of the first things that was learned through experimental research on hypnosis was that all behaviors seen in hypnosis can also be obtained without hypnosis. ...This, of course, cast doubt on the concept of hypnotic trance, doubt which has been reinforced by the failure to find any physiological or even self-report markers of the hypothesized state. It turns out that the most prominent experts cannot distinguish the self-reports of hypnotized subjects from those of subjects who have not been hypnotized. In other words, hypnosis has no physiological effect, just like a placebo. A patient is given a placebo and told that it will induce a certain result, but the "medicine" is a tablet of sugar, a glass of colored water-- some harmless and impotent substance. Kirsch's work immediately suggests that the therapist who administers hypnosis is identical in principle to the physician who administers the sugar pill. This does not, however, mean that the suggested effect does not occur. The scientific question becomes, rather, why does the effect occur? Kirsch illustrates that using blinking lights or spinning watches, saying "you are getting sleepy", and similar well-known hypnotic strategies, all exist merely to convince the subject to expect that the hypnotic suggestions they're given will occur-- but, he points out, there are many alternative ways to convince a subject. I can describe an example of non-hypnotic response expectancy that I used in a performance of Christopher Durang's The Marriage of Bette and Boo. In one scene, I speak as a witness at my parents' divorce trial. Throughout the scene, I took a series of cues from the other actors. A reaction to one line meant that I'd mortally wounded my mother's self-image. Another response showed me that I'd destroyed my father's hopes. A look, a glance, a gesture-- each typically occurring in the same place each night, each building upon the last. At the end of the scene, as my "mother" left the stage, she always paused and turned to place her hand on my shoulder. If I had been feeding myself the appropriate cues, then I expected her touch would plunge me into vicious, helpless anguish. And, every night, that's exactly what happened. Throughout this scene, I guarantee you I was not relaxing into a hypnotic state. I didn't need a "hypnotic state" to respond to the suggestion that I was anguished. I just needed to commit to the stimuli which created the expectation that I would be forced into near-hysteria, and pop! there it was. There is one mistake, however, that most clinical hypnotists continue to make, and that is the continued use of the altered state concept and terminology. The idea of going into a trance scares many clients and inhibits them from experiencing hypnotic effects. In contrast, debunking the altered-state myth and presenting hypnosis from a cognitive-behavioral perspective enhances subsequent responsiveness. I mentioned previously that I shouldn't attempt to analyze "hypnosis", but look for its effects; Kirsch's articles have made plain that "hypnosis" is that which can be identified as expectation management. I've mentioned how an adult's neurons become specialized, and have to be "convinced" to retrain themselves for a new skill. Perhaps that "convincing" can be accomplished by hypnosis? It's true that suggestive techniques are proven to influence otherwise-subconscious behavior (like self-induced amnesia); perhaps it's possible that, with hypnotic suggestion, a person's brain may become more able to apply their existing neurons to a new purpose such as perfect pitch. Maybe if you believe you will learn perfect pitch, your neurons will align themselves in order to make that easier? Unfortunately, a quick scan of Kirsch's writing seems to indicate that this is speculation. Nobody knows how or why suggestion affects the mind; they have only been able to observe that specific suggestions can have related results, and that hypnosis has no physiological effect on the brain. There is a strategy for learning perfect pitch using "trigger songs", but the strategy has recognizable pitfalls. "Trigger songs" are songs you know well, and when you hear a pitch that triggers that song in your head, you can name the pitch. If you hear something that sounds like the first note of Lightly Row, you know it's a G. Or.. is it? Scientific studies conducted on "trigger songs" have shown that people are typically able to recall the starting pitch of their favorite songs-- within two semitones. So there's already wide room for error. And, no matter what the starting pitch is, as soon as you sing the second pitch you have created an interval that's relatively correct. This makes the first note sound like an accurate part of the song, even if it's not the starting pitch you were trying to remember. Furthermore, if you listen to D-C-D-E-D-C-D-E right now, you'll notice that the D sounds differently depending on which note precedes it; unless you hear your pitch totally out of any context, it has a 66% chance of not sounding like the first note in your song (and that's to say nothing of timbre!). This doesn't mean that trigger songs don't work; it means that we need to recognize why it does work and use that to our advantage. I just now sang the first note of Lightly Row, and went to the piano; sure enough, I had produced a G. How did I do it? Because, when I sang that G, I hadn't tried to remember it as the first note of a song. Instead, I "played" the first three bars of the song in my mind, and asked myself, does this feel right? Does this song give me the same overall emotional "key feeling" as when I play it on the piano? If so, then this first note must be a G. And it was. By using a trigger song, I have successfully reinforced the pitch sensation of G, and I have also reinforced the key sensation of C-major. If you don't know how to use your trigger songs this way, your ability to accurately recall the first pitch of a song is, statistically, hit-or-miss, for a number of reasons. If you do know what you're doing, though, this and other exercises become true learning tools. I think that every exercise deserves an explanation, to help you use it most effectively.